2014 has been ranked as the hottest year on record by the UN’s weather and climate body. World Meteorological Organisation (WMO) analysis has shown that 14 of the 15 hottest years on record have all occurred this century, and experts warned they expected the warming trend to continue as greenhouse gases rises. Environmentalists have called on politicians to work harder to cut levels of pollution. The analysis by the WMO of different international datasets, including the UK’s Met Office and the Climatic Research Unit at the University of East Anglia, put average global temperatures last year 0.57C above the long-term average. This puts 2014 above previous record years of 2010, when temperatures were 0.55C above the long-term average of 14C and 2005, when temperatures were 0.54C above the average. But the difference in temperature between the warmest years falls within the margin of uncertainty, so while 2014 is “nominally” the hottest on record, there is very little difference between the warmest years, the WMO said. Two key datasets – by US government agencies Nasa and the National Oceanic and Atmospheric Administration (NOAA) – which are used in the WMO analysis, have already declared 2014 the hottest year on record. The Met Office and CRU said it was one of the warmest, nominally coming joint first with 2010. WMO secretary-general Michel Jarraud said: “Analysis of the datasets indicates that 2014 was nominally the warmest on record, although there is very little difference between the three hottest years. “Fourteen of the 15 hottest years have all been this century. We expect global warming to continue, given that rising levels of greenhouse gases in the atmosphere and the increasing heat content of the oceans are committing us to a warmer future,” he said. Much of the energy trapped in the atmosphere by greenhouse gases from burning fossil fuels ends up in the oceans, where it influences the climate, and global sea surface temperatures reached record levels in 2014. It was revealed in January that last year was also the warmest ever recorded for Scotland. In records going back to 1910, 2014 saw the warmest spring and third-warmest autumn. All but one month during the year proved hotter than the long-term averages. Recent research from the Met Office concluded that the global average temperatures seen in recent years would be highly unlikely in a world without human influence on the climate. It based its conclusion on an attribution study, where scientists use climate models and observations to see how likely an event would be in the real world and in a world without human greenhouse gas emissions – enabling assessment of how human influence has altered the chances of an event. 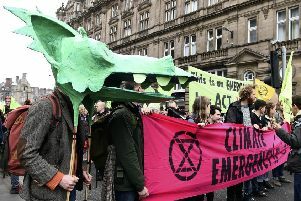 Dr Richard Dixon, Friends of the Earth Scotland director, said: “The warming trend is clear, just as climate science has long predicted. Rising temperatures in Scotland increase the threat of extreme weather events including floods and storms. Impacts on the global south are likely to be more life-threatening including crop failures, rising sea levels and serious water shortages. Some of the countries who are least responsible for past carbon emissions will bear the brunt of this changing climate.